Tech giant Google is partnering with Novartis to manufacture contact lenses that will help to manage diabetes in a more efficient manner. This offers potential to transform eye care and enable Novartis to compete in a global blood-sugar tracking market that is expected to be worth more than $12 billion by 2017. This technology provides a continuous, minimally invasive measurement of the body’s glucose levels via a “smart contact lens” which is designed to measure tear fluid in the eye and connects wirelessly with a mobile device. 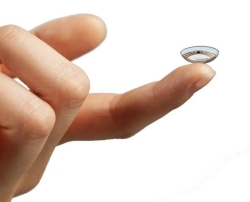 Non-invasive sensors, microchips and other miniaturized electronics would be embedded into the contact lenses. The other application is treating presbyopia, in which ageing eyes have trouble focusing on close objects. The smart lens has the potential to help restore the eye’s natural ­autofocus on near objects in the form of an accommodative contact lens or intraocular lens as part of the refractive cataract treatment. What do you think of this path breaking product? Will you use this when it comes to the market? Please share your views here. Previous: Previous post: Honey! Let me sleep..